--Moving in God’s Direction-- Integrating God’s Movement, part 7: “The value of theological reflection” by Mary Sharon Moore, M.T.S. By Mary Sharon Moore, M.T.S. Both spiritual directors and directees at least intuitively understand that on our own, we can't fully trust our insights. They’re our insights; we’re partial to them. We are subjective insiders to our own experience. And both spiritual directors and directees also discover the good news: None of us has to figure out the mystery of life alone! That is the grace of spiritual direction. The heritage of the Catholic Church offers a wealth of wisdom to guide us toward awakening to God’s movement in our lives. Everythingfrom the Church’s liturgical and sacramental life to dogma and doctrine, Church teaching, and the Church’s steadfast adherence to the centrality of Christ and the truth of God’s redemptive love contained in Scriptureall of this offers us guidance and encouragement as we move in God’s direction. That said, the connection between your experience and your Christian heritage may not always be clearor convenient. Movement from spontaneous opinion to intentional dialogue can be wrenching and slow, but it is necessary nonetheless for the journey toward mature Christian faith. Where do you start that intentional dialogue? Start where you are right now! You don’t have to “spiritually pretty-up” to get the conversation going. In fact, to do so would rob your reflection of its deeper insights and render it incapable of leading you to the sure movement of the Holy Spirit in the circumstances of your life. 4. Your opinions and convictions. These opinions and convictions are your statements of meaning, revealing your understanding of life. They can blind you to God’s activity or reveal God’s activity in your life. Willingness to change your opinions and convictions can lead to mature Christian faith. 1. What parts of my “lived experience” resist being named and brought into dialogue? 2. What opinions and convictions am I unwilling to open up for inspection and reflection? God wants all of my life, even the parts I’d rather hide. © Mary Sharon Moore, 2010-2011. Mary Sharon Moore is spiritual and vocational director to individuals nationwide. She is founding director of Awakening Vocations and author of Touching the Reign of God and Living in God’s Economy. Her columns and articles can be found at www.awakeningvocations.com. You can reach Mary Sharon at info@awakeningvocations.com. There is much in the media these days about the benefits of many different methods of “meditation” including methods that use breathing techniques, mantras, awareness, concentration, visualization, and compassion including many different types of meditation such as mindfulness, transcendental meditation, yoga, and Zen, etc. Each has a little different technique and goal and each may claim different benefits from helping one to concentrate, calming the mind, achieving peace and happiness, or just clearing out “mental junk”. What is the difference between these and Christian methods of prayer? The differences between Christian and non-Christian prayer is a topic dealt with in the book Word and Silence by Fr. Raymond Gawronski, S.J. in which he explains the writings of Hans Urs Von Balthasar. Balthasar was a Catholic theologian and priest who is considered by some to be one of the most important theologians of the 20th century. The book covers how non-Christian prayer methods, while containing some elements similar to Christian prayer, fall short of Christian prayer. The following is a summary of what is proposed by Fr. Gawronski based on the writings of Von Balthasar. All serious spiritualities propose solutions to the longing we have in our hearts for God, our inner guilt and the fear of death, but if we try to answer these questions without God’s revelation we do not arrive at truly satisfying answers. These answers come from God himself who has revealed himself to us through his Word in Scripture and in his only begotten son, Jesus Christ. There is a longing in our heart that only God can fill; as St. Augustine stated so well, "You have made us for yourself, O Lord, and our heart is restless until it rests in you." Religions that do not have God’s revelation about himself (such as the Christian Bible and through Jesus Christ) have developed their own myths and ideas of God (or the gods) and different ideas of prayer than Christians. For Christians, “prayer is a conversation” with God who is not the same as us. For non-Christians, if God is an “empty” absolute, a conversation with God does not make sense. Prayer can become more a conversation with one’s inner self, or just a “seeing”, or an inner experience. While similar terms like meditation and contemplation are used by Christian and non-Christian traditions, the meanings are different. Fr. Gawronski says “everything is decided by the question of whether God has spoken to man… or whether the Absolute remains silence beyond all earthly words.” (p. 148) He says both Christians and non-Christians agree that God is ineffable, but Christians affirm that God has revealed himself especially in Christ. St. Augustine recommended silencing ourselves to move up and out to God in prayer. While this may be a good beginning for prayer, Balthasar suggests that silencing ourselves interiorly is the resting place of non-Christian prayer that does not move on to encounter God in an interpersonal way. For Christians, prayer is a childlike stance before God who listens. God has no limitations to communicate with us as He wills. Christian prayer is listening, hearing and seeing with an attitude of “receptivity of the divine presence.” (p. 153) A Christian is to become a “hearer of the Word” (p. 150) both in Scripture and his own life and to answer by obedience rather than merely seeking an inner enlightenment as in some Eastern religions. Christian contemplation is an “act of hearing the divine Word”, and Christ is the Word of God. (p. 153). Prayer is a conversation between two who are unequal, so one becomes a listener and correct hearing becomes important as opposed to disappearing in a beautiful Zen Garden. Christian contemplation is a confrontation with God and an interpersonal way of love from person to person. Balthasar sees non-Christian meditation as a direct contrast with its “vague” and “fuzzy” qualities. (p. 154) Christian contemplation begins with the Word of Scripture and leads to the Word of God, i.e. Christ. Unlike many non-Christian traditions, man does not have to create some prayer space, to fly into ecstasy or silence himself “unduly” (p. 156) as man is created ready to hear the Word of God. It helps to recollect oneself in silence and solitude but not in a long drawn out process as the Christian is already present to God. This differs from some forms of Eastern prayer where one is to engage in prayer techniques to empty the mind and to keep it empty. The second feature of Christian prayer is childlikeness, i.e., a “wonder at Being”, “play”, or a “childlike simplicity” toward God as Father. Balthasar says that anawim “offer empty space for the Holy Spirit” and are stripped of illusions about self. He contrasts the beatitudes to any form of meditation technique; Yoga, for example, with its eight stages is more like becoming rich in spirit rather than poor in spirit. (p. 161) “Christian perfection” is not about experiences of God but rather “the readiness to fulfill the will of God.” This would be contrasted to Eastern practices, which seek enlightenment or other experiences. While seeing some possible good in non-Christian prayer such as “room for silence to listen” (p. 163), Balthasar at the same time sees the promotion of Eastern meditation as a main challenge to Christianity in our age. Besides a shared longing, he says that East and West are as “different as fire and water.” (p. 165) There is no real prayer that stops short of a true encounter with God. For Balthasar a Christian has direct access to God without having to pass through stages or going above human capabilities. Mysticism refers to a having experiential contact with God. For Christians it is a readiness to hear and obey God as opposed to a spontaneous awakening. For Balthasar seeking or even demanding experiences of God is an abuse of our natural tendency to want to experience God. In Zen, experience is the only reality and all is based on experience, like a flight out of oneself. Christian prayer rather seeks union with God and service and submissiveness to God rather than focusing on experience, even though powerful experiences may occur. For non-Christians the worldly self is empty or an illusion. Rather than seeing God, he sees through himself to no-thing and remains in emptiness. (p. 168) For Christians one finds Christ within himself; experience is secondary while living in faith is primary. Balthasar notes three distinctive features of Christian prayer. The first is love of God and neighbor. Secondly, love follows the way of Christ and may have intense experiences but experience is not the measure. Thirdly, there is a difference between the incomprehensibility or silence of God for non-Christian mysticism and God’s “self-utterance” or self-revelation in Christian mysticism. Balthasar rightly points out that nothing taught by Jesus is a technical instruction for contemplation. 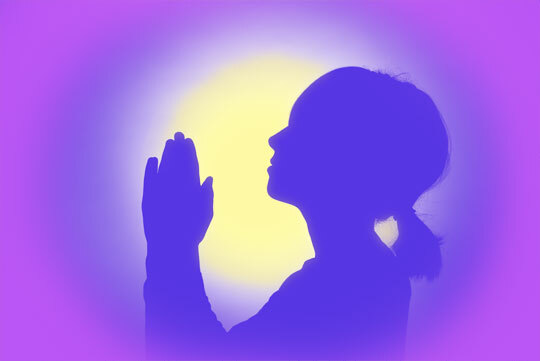 While Christians recollect themselves as a preparation for prayer, it is much different for Eastern forms of meditation which seek to find God through a technique. Christian prayer needs “purity of heart” and “submission in faith.” (p. 174) No technique can raise a Christian from faith to vision, only God can do that. The difference is that technique can be a means of power seeking to reach a man-made goal, while prayer is an openness to receive what God wants to give (p. 175). If there is a Christian “technique”, it is following Christ through obedience. The Christian is to be fully alive and himself, cooperating, being a co-worker, with God. Bathasar, while acknowledging some good things about Eastern forms of meditation as perhaps a preparation for prayer, does see Christians using Eastern techniques as a kind of betrayal of Christ especially if used as a kind of “narcotic.” Also Christian prayer leads to action, doing God’s will and not just to attaining a state inside of oneself as sought by practitioners of some Eastern methods. For our own discernment about prayer techniques, it is important to note that Eastern traditions put a huge emphasis on some kind of experience or enlightenment and there is now a kind of commercialism of religious experience. When people pray now they tend to evaluate whether or not their prayer was of value based on the experience they have had, therapeutic effects, intellectual effects, awareness or consciousness they did not have before. Buddhism or Hinduism are marketed as a promise of experiences, new conscience awareness, ecstasy, going beyond yourself, and when you have this experience you can live a better life, supposedly get to your true self and let go of false self, etc. In Christianity the focus should be on God and his revelation through Jesus Christ with an emphasis on obedience and receptivity and a readiness to respond to the Word. This is more important than enlightenment or therapeutic effects of ecstasy or any other state of consciousness that might be achieved. God will gift those who pray in the ways that he sees are beneficial for them. For Christians, prayer is relational between God and us, a mystery of love and dynamic of freedom, and it evokes greater and greater freedom the more this loving freedom is responded to. Authentic Christian prayer is the meeting of two freedoms, the infinite freedom of God and the finite freedom of man. Balthasar’s evaluation of the differences between Christian and non-Christian prayer practices is helpful for us in our time due to the influence of New-Age and Eastern religious practices in our society. Christians would do well to stay with traditional forms of Christian prayer as outlined in the Catechism of the Catholic Church and as taught by the Saints, especially the Carmelite Saints, who have excellent writings on the higher forms of prayer including mystical prayer. Includes feedback forms for comments and questions. For more information on "Seeking Union with God" Spiritual Formation Program go to: www.CatholicSpiritualDirection.org/csfsignup.html. The "Universal Call to Contemplative Prayer"
You are invited to share this newsletter with others. This newsletter is sent out monthly. If you have any suggestions for articles, feedback for this newsletter, or for reprinting articles contact Kathryn@CatholicSpiritualDirection.org.